= B.C. Treaty Commission, aka the "BC Trick-or-Treaty Con-mission". Find out more about the colonial government's attempt to undermine sovereign rights and negotiate fraudulent agreements, and the native resistance to this bogus 'treaty' process. 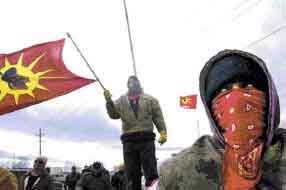 Also information on the Nisga'a deal, the 'template' for extinguishment of native rights. = The Gitksan-Wet'suwet'en case: Important in understanding how the legal establishment uses the 'land claims' approach to undermine native sovereignty. These pages are hosted on NativeWeb. Thanks to VIPIRG for hosting the site from 1995-1999, and our hosts since 2002, Nativeweb, for their generous support. SISIS has been on hiatus since 1999. 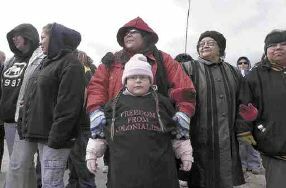 We created a new section of the site in 2006 in response to the emergency of state violence against Six Nations people, but are not able to continue over the long term. For people looking to get involved in local solidarity efforts, we recommend the Indigenous Peoples Solidarity Working Group. "Radical Website of the Week"